1. Singing in Church. Midnight Mass is definitely the highlight of my celebrations. It is a tradition I am proud to continue today with my Blessed Sacrament Church of Hollywood Choir. 2. The “Rudolph the Red-Nosed Reindeer” light that one of my childhood neighbors put out on their row-house porch each year. THE sign I counted on that the Christmas season was upon us. 4. The fuzzy maroon sofa set we inherited from our relatives one year. Sitting in the corner seat, next to the radiators, drinking tea, looking at the neighborhood lights and the snow flurries – I felt like a princess in a palace. I still have the ottoman from the sofa set and I am going to enjoy it by the fireplace (now real, not imagined) this season all over again. 5. 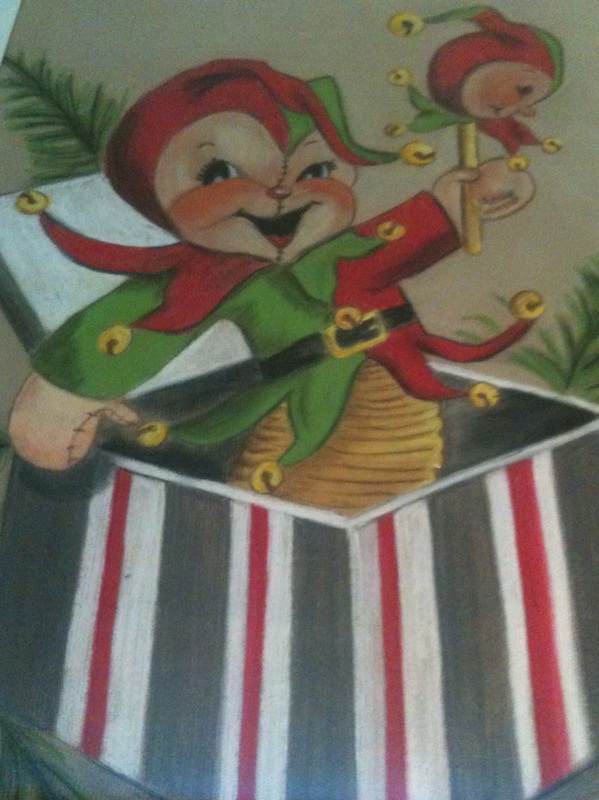 My mother’s beautiful Jester/Jack-in-the-Box pastel drawing which is now oh-so-proudly displayed at home over my living room fireplace. It is THE most important thing I remember from my childhood Christmas. The beautiful little face and and the sincere spirit coming from this drawing she created when she was just 15 years old moves me every time I look at it. How wonderful! My two daughters are very artistic and I give so much credit to my mother’s creativity gene. I will make sure my girls treasure this picture and include it in their Christmas Futures. I send out a heartfelt wish of love and remembrance to you all. There are so many Christmas Pasts that have morphed into my Christmas Presents. You are in my heart, always. This entry was posted in Christmas, Family, Memories, Music and tagged Choir, Christmas, Family, Favorite Things, Gaudete, Memories. Bookmark the permalink.